Kohler Power Systems recently came out with an alternate version of the 20resa and changed things up with the Kohler 20resb. The biggest difference is the exterior case. It is not a Polymer case, but an all aluminum case. The reason for this is very simple, you can place this generator as close as 18″ to a combustable wall. In many installations, in certain jurisdictions, local codes follow manufacturers clearances from combustibles. With the Kohler 20resa those clearances are set at a minimum of 36″, and with the Kohler 20resb those clearances are cut in half to 18″. In some instances, there are very few places to place a generator to meet local codes, but now we have more options with this generator. The picture below is a 20resb and it has the same foot print as the 20resa. 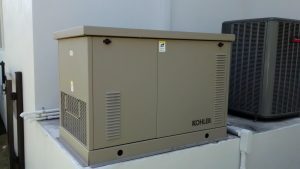 The generator is located on a elevated concrete pad with an AC unit within 24″on the right and is placed off of the back wall 24″ . If this generator was a 20resa, the local code would not pass this generator, but since it is a 20resb with 18″ of recommended clearance, it passes local code. If you have minimal space for a generator this 20resb might be the one for you! Give us call at 239-566-1769 or email us at sales@westcoastgenerators.com for your free estimate.